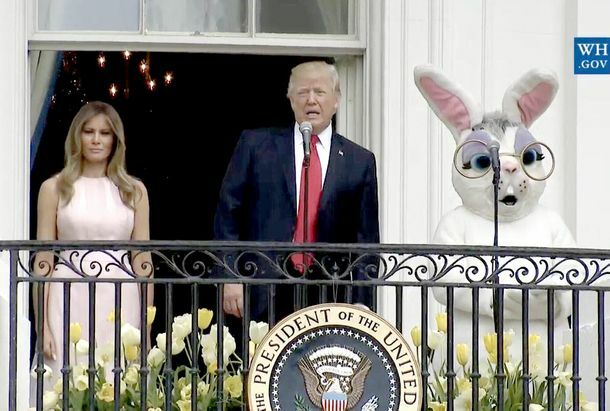 Melania Trump Had to Remind Donald What to Do During the National AnthemThe president needed a little nudge during the Easter Egg Roll festivities. Trump’s White House Can’t Even Get the Annual Easter Egg Roll TogetherInsiders say the plans aren’t going smoothly. Nice of Beyoncé to Invite the Obamas for EasterAw, even the dogs were invited. 7 Kids Who Did Not Enjoy the WH Easter Egg RollSometimes, the White House can be a dark place. Easter Bunny Lurking Behind Obama Can’t Help But Look CreepyPhotos from the annual White House Easter Egg Roll. Glee Cast Gets White House InvitationMichelle Obama asks cast to sing at Easter Egg Roll. Bailouts, Bankers, Brackets, and Bo: Obama’s First 100 DaysLet’s relive all of the memorable moments we’ve already forgotten. Text Your Friend a Drink From the Comfort of Your CouchBelvedere vodka launches a Website that allows you treat them without having to meet them.